Fishing is away of life on the Outer Banks, so it's no wonder the Outer Banks is one of the premier fishing vacation destinations on the east coast! No matter your fishing needs, you're sure to find it just around the corner from your Outer Banks rental home. The professionals working in Outer Banks fishing supply stores know their stuff - they can offer some great advice on surf, sound, pier, and charter fishing. 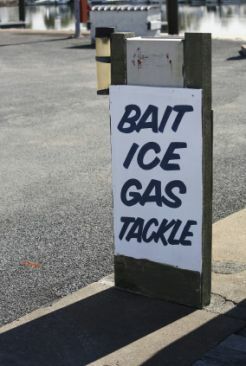 Outer Banks bait and tackle shops on this page are arranged by town, north to south. A Coastal Recreational Fishing License is required to fish on the Outer Banks. Children under 16 are exempt. An individual does not need a license for charter boat and pier fishing, which are covered by a blanket license. Anglers should know the current marine fisheries regulations, including size and creel limits. Corolla Bait & tackle carries all the fishing and crabbing supplies for your stay. Not only do they carry the LARGEST selection of quality, top line tackle and fresh bait, but they will gladly steer you on the right path to catching fish on our beaches! From the novice angler to the seasoned pro, OBX Bait and Tackle have the equipment and advice for all skill levels. They have an extensive selection of rods and reels, tackle, and a huge selection of fresh, frozen and live baits. Located in "downtown Duck" you'll find friendly service and bait, rods, tackle and, of course, advice! Sharky's tackle shop at Barrier Island Station in Duck features a large selection of rods and reels. They offer fresh bait (in season), as well as the finest artificial lures available from Fishbites, Honeyhole, Got-cha, Slurp and Sea Striker, just to name a few. Each store offers extensive inventories of rods, reels and tackle plus a complete selection of fresh, frozen and live baits. They stock a wide-range of hunting apparel. From waterfowl to whitetail, TW's has ammunition and hunting accessories for all sportsmen and women. The Avalon Pier is located at milepost located and stretches 696' into the Atlantic Ocean. The onsite store offers a variety of bait including bloodworms, squid, mullet, shrimp, and artificial lures. Forgot your tackle? Don't worry - you can rent some from them! Stop N Shop has a full service tackle department offerering the best selection of tackle geared to our local area. They specialize in speckled trout knowledge and lures, local hot spot fishing areas, daily fishing report, line winding station, hunting and fishing license, fresh and frozen bait, live eels, rods and reels, and more. Features a bait and tackle shop for all of your fishing needs. On site restaurant, The Pier House. The Oregon Inlet Fishing Center offers charter boat trips to the Gulf Stream, Inshore, Sound or Inlet. Daily, weekly, monthly and annual docking offered. Fish cleaning and processing, taxidermy service, complete line of grocery and camping items. Official North Carolina Saltwater and Fishing Tournament weigh station. Whalebone Tackle has everything an angler or commercial fisherman needs. The staff thoroughly knows their stuff, not just about what they stock, but how it’s used, where to fish, what’s in season, what’s being caught, what the regulations are, how to get to the best fishing spots and what to expect from the weather. A store as unique as Roanoke Island itself. Pick up all your fishing or crabbing supplies and gear to look great doing it! Sperry shoes, waders, gloves, fleece bodywear and more. Features exclusive S-Turns, Canadian Hole, Kite Point, Kinnakeet, and Reel Point merchandise. Get your bait and a souvenir all in the same place. Located at the most southern tip of Avon. 600' feet pier offers excellent fishing and a on site store for all your fishing gear needs, snacks and drinks. Host to the October drum tournament and the August children's tournament. Dillon's Corner offers a variety of nautical items as unique as Hatteras Island, a gas station and a tackle shop. Serving the Hatteras Island fishing community for over nearly 30 years. The Fishin' Hole offers live-bait and a retail and repair shop tackle shop. The Fishin' Hole is also an official weigh station. Stop by and pick up your fishing accessories and take a look at the record setting Red Drum! Not only is Frank & Fran's an official weigh station it's got everything an angler could need under the sun! Nice stock of fishing tackle, bait, ice, groceries, t-shirts, outdoor clothing, guns, ammunition, hunting supplies and more! Conveniently located between Buxton and Hatteras Inlet. Hatteras Harbor Marina offers an eclectic mix of gifts, fishing supplies, charter boat fishing and deli. All your needs in one convenient location. Also called Rodanthe pier because of its location this 850' fishing pier boasts some of the best fishing on Hatteras Island. Seasonal, daily and weekly passes are offered. Hatteras Island's Premier Fishing Tackle Outfitter. The best in custom fishing tackle! Rods, reels, rigs, baits, and advice! Island Convenience offers a full service garage, tackle shop, groceries, deli and souvenirs.